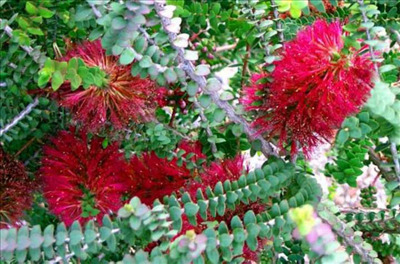 Beautiful medium shrub with grey-green leaves and large deep red bottlebrush flowers appearing in summer. Tolerant of most well-drained soils in full sun or partial shade. Tolerant of extended dry periods & frost. Plants respond to pruning and can be grown as a hedge or screen or pruned to tree shape. Excellent container and bird attracting plant.